The Give a Scan project seeks to build a much-needed database of lung cancer images and data for researchers. It’s been nearly 40 years since then-President Richard Nixon declared war on cancer in his State of the Union address and signed the National Cancer Act into law. While the overall cancer death rate has declined, lung cancer continues to take more lives than colon, breast, prostate, and pancreatic cancer combined. Experts estimate that about 215,000 new cases of lung cancer are diagnosed each year, slightly more in men than in women. And more than 161,000 Americans die of the disease each year. In 1972, when the National Cancer Act was passed, the five-year survival rate for lung cancer was 13%. Today, it’s increased to only 15%. Advocates for lung cancer patients cite several reasons why so little progress has been made. One is that lung cancer research is underfunded. “Indeed, lung cancer research is so underfunded that many scientists don’t want to go into it and put their careers in jeopardy,” says Laurie Fenton Ambrose, president and CEO of the Lung Cancer Alliance (LCA), a Washington, D.C.–based nonprofit organization dedicated to raising awareness and changing healthcare policy to support services for those who are living with or at risk of developing lung cancer. The second is a lack of raw material for research, including tissue, blood, and sputum samples; scans; and clinical data. 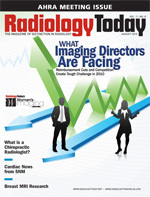 Such scans and other raw material hold enormous potential for developing not only new cancer-fighting drugs but also the most effective personalized therapies, according to Daniel C. Sullivan, MD, a radiology professor and director of the Imaging Core at Duke University Medical Center in Durham, N.C., and science advisor to the RSNA. Yet little such raw data have been made available. One reason the raw material for lung cancer research has not been made available is the nation’s emphasis on protecting patient privacy. In 2004, when Avila was part of a scientific panel addressing the lack of data for lung cancer research, he had an idea: Why not have lung cancer patients donate their scans in the same way people donate their organs? The audience thought Avila was kidding, but he believed the idea had merit and vigorously pursued it. He sought the help of the LCA, as he is a member of its medical and scientific advisory board. This June, his doggedness paid off: The LCA launched the first open-source website for lung CT scans and clinical data donated by cancer patients called Give a Scan (www.lungcanceralliance.org/giveascan). Clinicians and patients can obtain more information about donating scans by e-mailing giveascan@lungcanceralliance.org. The project launched with scans from nine patients whose data can be accessed without charge by researchers around the world. Each patient gave at least one scan while some patients gave several. The website contains pages allowing researchers to download some or all of a patient’s imaging data—whatever they find most useful. Search tools allow researchers to determine whether the data available are of interest to them and their study. The only requirement is to acknowledge using Give a Scan project data should they publicly present material from the site. Sullivan, who serves as a member of Give a Scan’s advisory board, expects the data to be most useful to researchers trying to develop algorithms to detect lesions or measure lesions over time to determine whether certain therapies are effective. It’s likely that the researchers will have worked with carefully selected scans to develop their algorithms, Sullivan explains. For example, the National Cancer Institute’s Cancer Imaging Program developed its database of spiral CT images of the lung to aid in developing better algorithms for computer-aided detection. “But they could use the scans from the [Give a Scan] database to determine whether the algorithms they developed would apply to all scans and how well their algorithm works when the technique used to obtain the scan or the quality of the scan differs,” Sullivan says. The database could become a way of validating their research. Sullivan says the scans currently included in the Give a Scan database, along with any future scans, are high quality. “We expect they will be even better than the little that has been accumulated for research over the past few years,” he says. Avila has spent a lot of time over the last several years working on the infrastructure necessary to get Give a Scan up and running, Sullivan says. Researchers like Avila, who has developed computer-detection programs for lung cancer, should find it a valuable resource, he says. According to information Fenton Ambrose has received, word of the Give a Scan website has spread and researchers, particularly in Europe, are using it. It also has gained the attention of the National Institutes of Health, Avila says. Fenton Ambrose says all data collected for the project were accepted, but some scans were in a format that could not be read. The most common problem was the thickness of the CT scans. “A surprising number were unusable because the calibration was too thick,” she explains. A future benefit of the project, Fenton Ambrose says, could be that it helps establish uniform or best practices for CT lung scans. “It could help set the standards for lung cancer imaging,” she says, noting that something similar happened with breast cancer and mammography in the early ‘90s. “There were variations in the way people conducted mammography, and Congress stepped in and enacted the Mammography Quality Standards Act, which put into place uniform standards for doing mammography,” she says. To start the project, the LCA contacted patient advocates around the country, explaining the program and asking whether they would be willing to submit scans. Many responded to the request. Lung cancer patients and their families are eager to help others in any way they can, according to Fenton Ambrose. Of the scans that were submitted, nine became a part of the first pilot program for the Give a Scan program. Sadly, of the nine patients whose scans are in the initial database, four have died. Submitting the scans is easy for patients. They ask their physicians to put the scans on a CD or a DVD and then send it to Give a Scan along with the patient profile and consent forms they have requested via e-mail. “We ask the patient to submit a history of their diagnosis, along with answers to questions about their family history and about their smoking history and about their treatment,” Fenton Ambrose explains. Interestingly, Avila says, of the nine scans that launched the site, five of the patients who submitted scans and who have lung cancer were not smokers. Once the scans are submitted to the project, information that could identify the patients is removed. No information that could be used to identify the patient by name or location is made publicly available. Having the patients themselves submit the scans and then removing identifying information is a perfectly legal way around the HIPAA law and privacy issues, Avila says. Some demographic information about the patient (eg, gender, age, diagnosis, smoking status) is preserved for researchers to see. Avila has used the initial scans in the database for a preliminary study published in the July issue of Academic Radiology, the official journal of the Association of University Radiologists. Avila is the lead author of the study “A Quantitative Method for Estimating Individual Lung Cancer Risk.” The study examined 15 lung cancer patients and 93 similar individuals with no history of cancer from a group of 108 patients screened at an International Early Lung Cancer Action Program site at the University of Navarra in Spain. The study’s aim was to assess the performance of a new method for estimating individual lung cancer risk based on analyzing airway bifurcations on high-resolution CT scans and spirometry. “What we found was that individuals with lung cancer had high calcification in a clear relationship with their ability to exhale,” Avila says. When reviewing the scans for the project, Avila observed that one patient, a nonsmoker, had very high calcifications. “She fit our mathematical model for risk of developing lung cancer very well,” he says. “She had good lung function and was never a smoker but at the age of 62, her bifurcations were highly calcified. Her data became an example of the risk index that we were investigating.” Avila says he’s sent her data to colleagues, and the information has been discussed around the world as an anecdotal case in a new finding for detecting lung cancer. — Beth W. Orenstein of Northampton, Pa., is a freelance medical writer and regular contributor to Radiology Today.